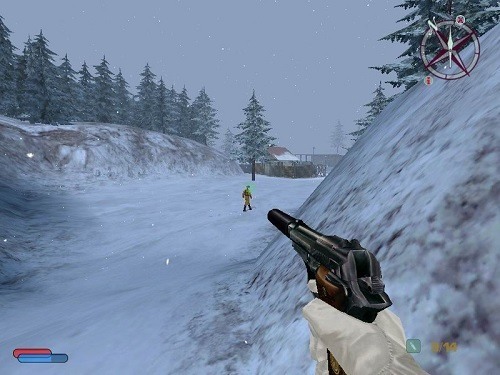 No One Lives Forever 2: A Spy in H.A.R.M.’s Way (NOLF2) is a first person shooter that encourages players to use stealth to achieve their goals. Launching in 2002 off the success of the original this game promises a good experience for players both new and old. The game follows your adventures as Cate Archer, one of the top spies in UNITIY who is chasing the criminal organisation of H.A.R.M. to try and find out what they are up to. The game takes you across a good range of locations from Syberia to India and Japan. Each setting is well designed with different enemies and soundtracks to give you a better sense of the changing environments. NOLF2 splits gameplay up into various long missions that offer plenty of exploration and freedom in approaching your objective. Many of the missions have multiple paths for players to pursue allowing the game to cater to both action and stealth orientated players. With a large range of weapons and gadgets to achieve your objective you’re never short on options. To help you shape the adventure you’ll have a great skill system that lets you increase Cate’s skills. If you prefer a more direct approach then you can choose to increase skills like marksmanship, armour, weapons and carrying to support that play style by keeping you alive for longer while dealing more damage. On the other hand stealth based gamers have the option to improve stealth, gadgets and search to increase their ability to hide and quickly search for the required information. You’ll find that earning experience is fun with exploration and side quests offering healthy rewards that encourage you to search around every corner. No One Lives Forever 2: A Spy in H.A.R.M.’s Way is a great game that you’ll want to play more than once with its multiple paths and well written story that doesn’t ever feel dry. A first person shooter that combines combat and stealth. Large missions with fairly open levels. A great skill system lets you customise Cate Archer. Appropriate for new and old fans.